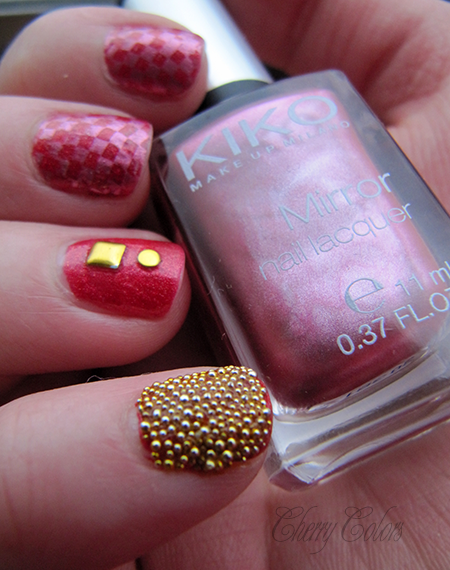 Gold, red and pink - Cherry Colors - Cosmetics Heaven! Since my kid was born, I never thought I'd have the time to do my manicures again. During the day he needed so much attention and he wanted to be held so many times, at night there was not even just one full sleep night. But now things are changing and I can do my manicures again! Even if that means that one night I do the basic color and the second night I add nail art. Well, this is exactly what I did with this manicure. One night the color, the next day the nail art :). 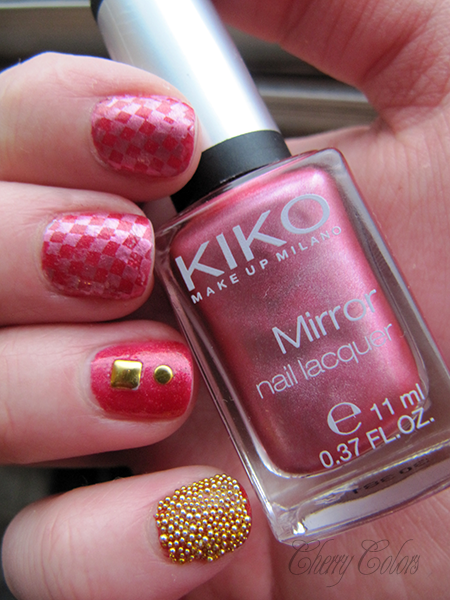 I used a very old S-he nail polish (435), some Essence stamping plates, gold beads from Ebay, gold studs from another site and the beloved Kiko mirror I've been using for stamping. I applied a double layer of top coat on the beads, so they are extra sturdy.